How Should I Store My Backup Laptop? - Ask Leo! Four basic approaches to storing a laptop that isn't being used. I recently replaced my laptop with a desktop, moving the laptop to a backup-machine status. That means I won’t use it daily, or evenly weekly. How should I store the laptop? Battery in? Battery out? How long can I store it without charging it? Any other issues I should consider? I’m going to assume you’ve already seen Should I remove the battery if I leave my laptop plugged in? What’s interesting here is that yours is a different — almost opposite — situation: infrequent use. That actually makes this more difficult. Let’s review the options. This might be the easiest option to rule out. By leaving the laptop battery in and plugged in, it’ll be in a state of constant charge. This is less than ideal for most batteries, and will shorten their life. Ironically, by keeping them continuously fully charged, they lose their maximum capacity slowly over time and discharge more quickly. If you were using the computer — for example, if you left it on 24 hours a day — this might make some sense. The battery will still degrade, but at least you’re getting some use out of it while it does so. Coincidentally, this is what I do for my two laptops that have been relegated to “on the shelf, but always on” roles in my own computer menagerie. But if the machine’s not even on, I can’t make an argument for this as an appropriate solution. This might be a reasonable approach, depending on how often you plan to fire the machine up. The battery will slowly discharge, of course, while the machine is off. But if you turn it on often enough, it’ll work well. Unfortunately, I can’t tell you how often “often enough” really is. I will say that if the battery drains to the point of not being able to boot the computer without being plugged in, it’s probably been too long for this approach to make sense. And yes, once you do turn it on, make sure to plug it in and leave it plugged in long enough to let it charge fully. If you don’t plan to use the computer for “a long while” (and as before, I can’t tell you how long “a long while” might be), then removing the battery might well make sense. The battery will still discharge completely, but it’ll probably do so more slowly than if you’d left it in the machine. And once again, when you do re-insert the battery and turn on the machine, I think it makes sense to let the battery charge fully before turning things off and disconnecting. There’s a lot of variability here, depending on exactly what laptop you have, what battery you have, how good it was to begin with, and how often you find yourself using the machine. In the long run, I’m not sure any of the alternatives make a significant difference. The bottom line is your machine is old enough that you’ve elected to move it to your second tier, so it’s safe to assume things aren’t pristine. The differences between the options above — particularly between options two and three — probably aren’t enough to warrant going too far out of your way. It’s what I do. And what’s convenient for me is to leave the batteries in their respective machines, whether or not the machine is in use, or whether or not the machine is plugged in. My experience is that by the time a different approach might make a noticeable difference, the machine is so old as to be unusable for a variety of other reasons. Can I Leave a Laptop Running All the Time? - Leaving a laptop running all the time boils down to two things: your convenience and a decision. Should I remove the battery if I leave my laptop plugged in? - Battery technology, while not increasing all that well in terms of capacity, is increasing in lifespan. But there are other advantages, regardless of battery life, to leaving the battery in your laptop. I spilled water into my laptop, how do I get it working again? - Spilling liquid into your laptop or keyboard can cause serious damage. The first step is to dry it thoroughly, and we'll look at one possible solution. « Previous post: Will Microsoft Stop Forcing Windows 10 Updates? From personal experience, by the time I’ve relegated a laptop to backup status, the battery is usually pretty degraded from normal usage. At home, I always remove the battery and use mains power when using my laptops. I occasionally use the battery just to do a discharge/recharge cycle. About a year ago, I had to send my laptop out for repair (it was still under warranty) I bought a new one and decided to keep the first one for backup. When it was returned, I didn’t even open the box. It’s still in the box and stored away for the day the one I’m using now either needs repair or be replaced. Obviously the battery in the repaired laptop is connected but the computer is not plugged in. Should I remove the repaired laptop and plug in the computer occasionally? If so, how often, and for how long? If you read the article, you’d see that there’s no “right” answer. It should give you some help in making your decision. This is all addressed in the article you just commented on. I researched this a few years ago, and now adopt this process: 1) I keep my 6 old X61 Thinkpad laptops and batteries in a cool room at a fairly constant temperature about 14C with the batteries out; 2) Every 6 months I get the laptops out and do Windows Update and Virus Update. 3) Usually the batteries have dropped to somewhere between nil to 20% charge, so I charge the batteries up to about 70-80% charge; 4) Then I store away again. The goal is to minimise the stress on the battery by operating inside the charge limits. Also to have most updates in place. 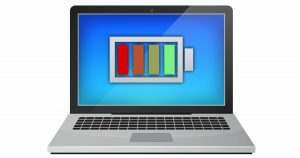 For laptops that have advanced battery management capability (e.g., Lenovo ThinkPad series) the best approach is to set them for a battery charge of approximately 50% and keep the laptop plugged in. Lithium-ion batteries (the type now used in laptops) are degraded by overcharge, too rapid charge, and of course by the number of battery charge-discharge cycles they’ve seen. They last longer if maintained at about 1/2 charge. Unlike the old NiCad batteries, Li-ion do not have a “memory effect” and do not have to be periodically discharged then fully charged to help maintain their capacity. My laptop, now 7 years old (with the original battery), is used primarily for travel b/c I like the larger keyboard and giant screen of my desktop. At home I leave it plugged in and set to start charging at 45% and stop at 55%…enough for 3-4 hours run time. I start it up at least once a week to get updates and synchronize mailboxes. When I have a trip coming up and know I’ll be running on battery a lot (e.g., in airports, on long flights) I charge on up to “100%” and later, when I return, go back to the setting for plugged-in operation. If the charge is above 55% when I return I’ll let it run on battery a while to pull the charge back down to the long-life range described above. Diagnostics and run time when unplugged tell me the battery is still going strong. Keep in mind that manufacturers match their batteries and chargers for best service, so if you ever have to replace a battery it’s best to use the OEM part instead of one from another source. In fact, some laptops will refuse to charge a non-OEM battery, just as some printers will not work with generic ink cartridges. Yes, they do it to increase revenue but in the case of Li-ion batteries it may also prevent a flaming laptop! I attended a technical symposium in Chicago last week and we had extensive discussion of Li-ion battery safety, including a presentation by representatives of two major air carriers. The threat of Li-ion battery fire is very real but being kind to your battery makes that much less likely.